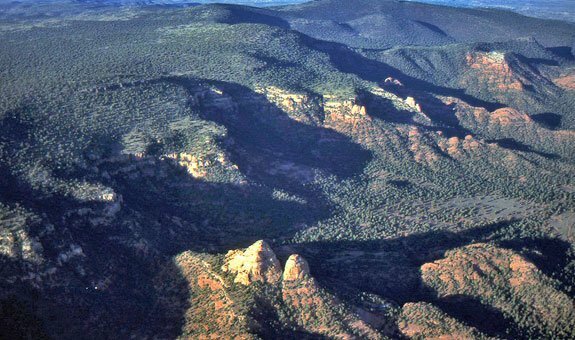 Beginning about 15 million years ago, volcanism returned to the Sedona area in the form of basaltic cinder cones, shield volcano’s and lava flows. Volcanism lasted until about 10 million years ago and all of the volcanic rocks seen along Interstate 17 from Sedona to Cave Creek belong to this period of volcanism. House Mountain is located about seven miles southwest of Uptown Sedona, between Page Springs on the west and the Village of Oak Creek to the east. It was active for about 2 million years from 15 to 13 million years ago. A curious feature of the volcano is that the lava flows only extend in three directions away from the central crater –south, east and west. Why no lava flowed to the north remained a mystery until detailed mapping was carried out that reveal that the former presence of the Mogollon Rim here precluded the flow of lava to the north. Since 13 million years ago, the Rim has retreated to its present position. This means that the Rim has an average rate of cliff retreat of about one foot every 625 years. What a find! There are some fantastic trails that provide access to House Mountain volcano and one of the best is the Turkey Tank Trail, just west of the lower end of the Verde Valley School Road. The trail begins through eroded bluffs of the Schnebly Hill Formation and slowly climbs 2.5 miles to the edge of the volcano’s central crater. Look to see if you can find the Ft. Apache Member of the Schnebly Hill Formation as you approach the summit. One can continue (off trail) across a small drainage in the volcano vent area to the top of the mountain and the remnant lava flow that gives the mountain its name. Pioneers in the area likely observed a juniper tree growing out of the top of the flow making it look from the valley like a house replete with a chimney attached.